In a cosmic twist of fate, two identical twins will followeach other into orbit next year during NASA's final planned shuttle mission tothe International Space Station. Scott Kelly andMark Kelly of West Orange, N.J., are a pair of veteran NASA astronauts and captainsin the U.S. Navy. 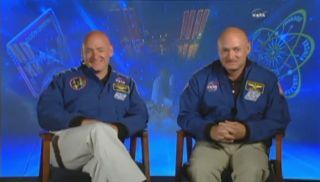 "We're looking forward to flying together," MarkKelly told SPACE.com. "It's not expected. We're hopeful that this worksout." The twins, who were born six minutes apart in 1964 (withMark arriving first), were chosen 32 years later to join the astronaut corps. Thedownside of having them in space simultaneously is that their parents will geta double dose of worrying. "They certainly get nervous when we fly, but I think it'slike all parents do," Scott said. "It's somewhat of a risky business,and we try to mitigate that risk as best we can." The astronauts said they had been surprised and thrilled to bothbe chosen to join NASA. "It's just a real privilege to be able to work for thespace program," said Scott, a veteran of two space shuttle missions. "There'sa lot of qualified people out there, and you know there's really a whole lot ofluck and timing. We both feel very privileged to be able to serve our countryin this capacity." The brothers' missions are coming at a landmark time for thespace program. Mark Kelly's shuttle flight will be the second of NASA's two finalscheduled missions, though there is a chance one more will be added before theshuttles are retired. Discovery will fly to the space station in November,followed by the Endeavour crew next year. "It will certainly be the last flight ofEndeavour," said Mark, who has flown on three shuttle flights. "It'sgoing to be sad to see the spaceshuttle retired, but you know, it's necessary." NASA is retiring its three-shuttle fleet to make way for anew goal, to send astronauts to an asteroid by 2025. The space agency has been flying space shuttles since 1981.Once they retire, NASA will rely on Russian, European and Japanese vehicles tofly cargo and crews to the space station until commercially built Americanvehicles are available. For his part, Scott said he's excited to spend some qualitytime aboard the orbitingspace station as commander of the Expedition 26 mission. He has visited thespace station only once during his two spaceflights; the other flight was tothe Hubble Space Telescope. "I think it?s a great time to be flying on the spacestation, as the station gets complete and we can finally gear up our scienceprogram to a hundred percent," he said. "The space station is anamazing facility ? I think a lot of people don?t realize just what anincredible achievement it's been." Both brothers plan to share their experiences in space viathe microblogging site Twitter. Scott Kelly posts Twitter updates under thename StationCDRKelly. Mark Kelly's Twitter posts appear under his pen name:ShuttleCDRKelly.